Part Theartre….Part- Gameshow…Part Human…It is….. 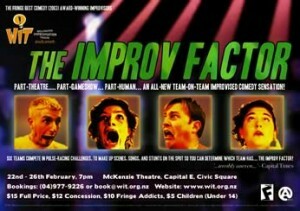 The Improv Factor :The Improvised tribute to TV Gameshows! Where: McKenzie Theatre, Capital E, Civic Square. This entry was posted in Other formats, past shows and tagged comedy, game show, improv, improvisation on February 22, 2005 by MaDmin.